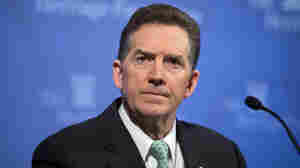 September 26, 2013  Former South Carolina Sen. Jim DeMint, now leading the Heritage Foundation, has been one of the most influential voices in the budget brinkmanship on Capitol Hill. "There's no question in my mind that I have more influence now on public policy than I did as an individual senator," he says. 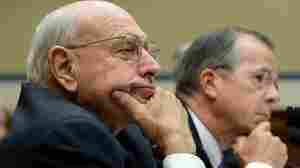 September 25, 2013  Congress has just days to avoid a government shutdown when the new fiscal year starts next Tuesday. Standing in the way is a House provision that cuts off all funding for the health care law known as Obamacare. The aim is to cripple that program just when its major provisions are about to kick in. But the Senate is not expected to pass any bill that defunds or delays Obamacare. September 21, 2013  More than a year after four Americans were killed during an attack on a diplomatic mission in Benghazi, Libya, House Republicans continue to hold hearings dedicated to pushing their view of the episode. But Democrats also highlighted this week's hearing, believing it would help put the matter to rest. September 19, 2013  On a day when most in Congress were obsessed with an increasingly likely government shutdown, the House Oversight and Government Reform Committee held a marathon six-hour hearing on what one Republican called the most important issue to the folks back home: the 2012 attack in Benghazi, Libya. September 19, 2013  When Kentucky businessman Matt Bevin jumped in to challenge fellow Republican Mitch McConnell in next year's primary, the Senate minority leader responded by lying low on controversial issues. And so far, McConnell has steered clear of an attempt to tie must-pass funding bills to a defunding of President Obama's health care law. September 16, 2013  Prospects for a government shutdown seem higher than they have in years. With two weeks to go before the budget year ends, a contingent of House Republicans are insisting that any spending bill must "defund" Obamacare — a condition the Democratically-led Senate and President Obama say they will not abide. September 13, 2013  John Kerry spent years in the U.S. Senate, and many months running for president a decade ago. Neither role gave him as high a profile as he has now as Secretary of State, when every word he utters is scrutinized by an international audience. September 12, 2013  One of the most powerful lobbies on Capitol Hill is AIPAC, the American Israel Public Affairs Committee, which commands bi-partisan respect on Middle East issues. 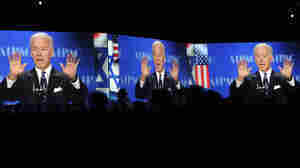 But on the matter of possible military strikes on Syria, AIPAC is having a rare tough go of it. August 16, 2013  The Justice Department has called for prison sentencing reform — but it's really Congress that would have to carry it out. The time may be right: Crime is down, and even conservatives favor sentencing reform to save money. GOP Debate: Is Obamacare Fight Worth A Government Shutdown? August 14, 2013  Some GOP lawmakers want to block all money for Obamacare in a stopgap spending bill that must be approved next month to prevent the government from shutting down on Oct. 1. But other Republicans say that won't work and may well backfire. August 9, 2013  Second term GOP congressman Blake Farenthold is being targeted during Congress' summer recess by advocates of the Senate's immigration bill. Activists are organizing petitions and a demonstration at Farenthold's "open house" at his Corpus Christi office. And opponents are fighting back. 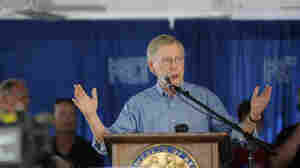 August 5, 2013  Over the weekend, the western Kentucky town of Fancy Farm was the site of the first meeting between Senate Minority Leader Mitch McConnell and his likely Democratic opponent, Kentucky Secretary of State Alison Grimes. National Democrats promise to make defeating McConnell the top priority as they head into a mid-term election that offers Republicans a good chance of taking control of the Senate. August 1, 2013  Congress goes on its annual August break Friday afternoon. And for the first time in recent years, members will leave town without a full-on crisis over must-pass legislation. No debt-ceiling meltdown, no fiscal cliff, not even a government shutdown. At least, not yet.